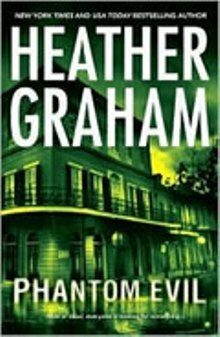 Set in the historic French Quarter of New Orleans, Phantom Evil by Heather Graham is a ghost story and murder mystery rolled into one. The city itself is detailed so realistically that it becomes practically a character in its own right, and glimpses into the city’s shadowy past give it an even darker side. A newly-formed paranormal investigator team comes to New Orleans to look into the murder of the wife of a prominent senator. Though the team has never met before, they each have a psychic talent of their own, and they are all haunted by their pasts. They are staying in the historic mansion that was the home of one of the city’s first serial killers, and the site of many of his grisly murders. The senator’s wife has been ruled a suicide, but the senator does not believe she jumped from the balcony to her death. That is what the team is there to discover: haunted by the death of her young son, did she jump? Or is something more mundane, and human, responsible for her death? With the team seeing ghosts and other threatening presences, and the murky associations of those closest to the senator, the answers are hidden beneath a veil of evil and lies that threatens the team itself as they race to uncover the truth. Ms. Graham does a masterful job of bringing the city to life in all its glorious, Technicolor detail, but she does just as good a job creating characters that are both memorable and realistic. The characters are flawed, but likable, and their different personalities shine through on the page. Some of the scenes in Phantom Evil are eerie, bordering on scary, and the urge to figure out what is behind the mystery will have the reader turning pages far into the night—and jumping every time something goes bump in the night.